PROJECT THE SECOND COAST. TOURSCAPE. 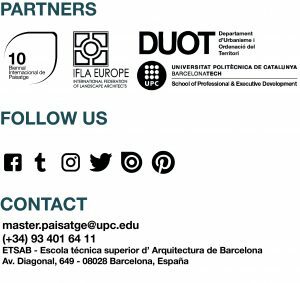 – Master in Landscape Architecture Barcelona – Universitat Politècnica de Catalunya – 35ª EDITION. Last week, our Master’s degree students began the Tourism post-degree workshop under the topic: Project the second coast. Tourscape. When the second war finished, the mass tourism developed intensively way over Mediterranean coast. The coast got into the better place to enjoy and relax for the people who wanted to run away from the city and re-encounter with nature. For the north and center European working classes, the south, poor yet warm, was offered like a “paradise”. Over the years, the tourism has turned into the economic engine in several coastal places, increasing year by year, the number of tourists with no reflexion about the coastal capacity. Is it an inexhaustible system? Nowadays, the “paradise” is endangered. Climate change and human-induced damage increase the decomposition of the tourist system. Projecting the second coast is a proposal to re-think the mass tourism under an ecological and social responsibility. This post-degree wants to think about coast damage and its recovery keeping in mind landscape, tourism and the territory conditions such us the possibility of re-define and rehabilitate the mass tourism concept. This course will be developed with theoretical lessons and practical works that will be taken in the classrooms. The following pictures show one of the classroom dynamics taken by Ricard Pie with Purificaicón Díaz and Monica Batalla. 1. Rimini, Emília-Romana region, Italy. 2. Borriana, in Plana Baixa, Valencia, Spain. MORE INFORMATION SUCH US THE TEACHER STUFF, LECTIVE HOURS AND CREDITS ON THE FOLLOWING POSTER.